To create a Banquet, please follow these steps. 1. 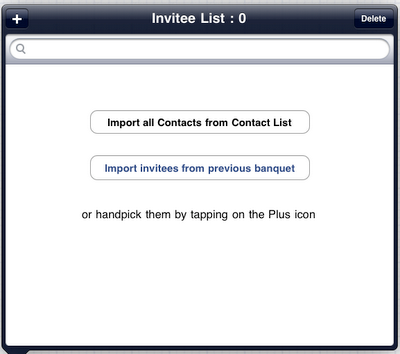 Tap the Contacts tab and add your invitees in the Contact List by tapping on the plus icon. 2. Tap the "My Banquets" tab and design your banquet layout. Create your Invitee List for this particular banquet by tapping on the Invitee List button. 3. Tap the "Import all contacts from contact list"
4. Assign guest to tables. Select a table, tap on 'Seating' button and tap on the plus icon to add guests to this table. 5. Confirm RSVPs by tapping on any of the options: Attending, Not attending, Maybe. You can also do it from the 'Invitee List' option.